Nearly 134 towns and villages in Sweden have the status of historic towns. Without question, the capital Stockholm differs from the others. The charm of the town comes largely from the colourful buildings, most of which are painted the in original colours of the state. This diversity can not but submit mood in each guest of Stockholm. The city is located in south eastern Sweden. With its population of 760 000 people Stockholm is the largest and most densely populated city in the Nordic countries. In Stockholm are the seats of government and parliament and the residence of the head of state, Carl XVI Gustaf of Sweden. The first historical evidence of Stockholm in writing comes from 1252 when the city is a major local centre of trade from iron mines in Berislagen. It is believed that Stockholm was founded by Birger Jarl, in order to protect Sweden from enemy sea raids. Initially Stockholm represented a fort, which had the main task of monitoring the trade between the Baltic Sea and Mälaren. This fort was erected on the island of Gamla Stan, where today stands the Royal Palace. 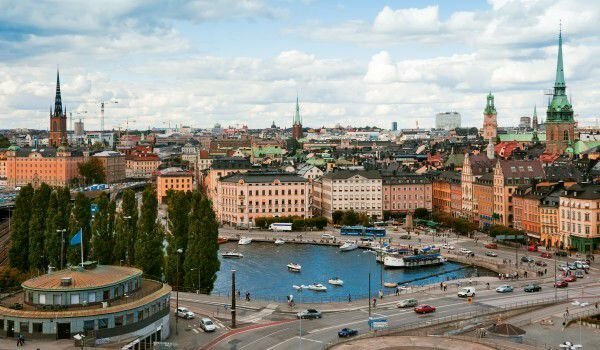 Stockholm was officially declared the capital of Sweden in 1419, when Sweden along with Norway, Denmark, plus Finland, Greenland and Iceland form a great kingdom. This continued until 1523 when the first independent King of Sweden was crowned - Gustav Vasa. 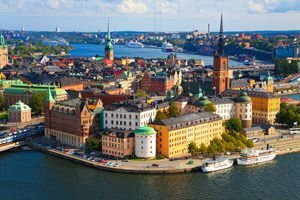 Stockholm is situated on 14 islands and coasts of the archipelago where Lake Mälaren touches the Baltic Sea. In practice, the city centre is surrounded almost entirely by water. Swedes like to say that Stockholm consists of one-third water, one third land and one-third parks buildings. This they claim comes from the interesting situation of the Swedish capital on the islands off the coast of the Baltic Sea. The old part of town is particularly picturesque, and a tour of the city and waterways Parks is something you should not miss, when you come to Stokholm. It is this array of canals that have earned Stockholm the nickname of "Little Venice". The old part of town named Stan Galma is the only place in Stockholm where you can see and feel the charm of the medieval atmosphere. The rest of the Swedish capital can be seen buildings in all western styles. An interesting fact is that the founders of the city had done everything possible to preserve the original colours, which the houses were painted. As a result, today most of the buildings dating from the 17th century are red, while those built after the 18th century glow in yellow tones. In other districts the predominant colours are white and grey. Several royal palaces in Stockholm can be seen on a sightseeing tour of the city. Most interesting are Drottningholm Palace and Kungliga Slottet. Drottningholm Castle is the official residence of the Swedish Royal family. This is one of the most impressive castles in Sweden and is located on the island Lovön, close to the capital Stockholm. Castle Drotningholm is included on the list of World Heritage by UNESCO in 1991, mostly because of its majestic theatre and Chinese pavilion. The gardens of the palace are very much reminiscent of those in the French jewel in Versailles. In fact, the model of france is built around Drottningholm. Other attractions in Stockholm are the National Museum, where you can browse a large collection of paintings. In Moderna Museet, you can see different paintings, Including works by Picasso and Slavador Dali. Interesting is also Vazamuzeet, which is located on an old ship.